You can delete a test variation only if the campaign is “Not Started” state. But, you cannot delete variations from a running or paused test. Deleting variations from a running campaign will affect the statistical integrity of your website data because running tests would have started collecting data and removing a variation may corrupt your test reports or mislead your decision -making process. As a best practice, we recommend that you first clone the test, delete the variation from the cloned test, and then start the campaign. To learn how to clone a test, click here. Open the test you want to edit. Click the three vertical dots next to Start. To open the page in the VWO editor, select Modify in Editor. In the editor, go to the Variations section, and then click the Settings gear icon. In Variation 1 options, click Remove to delete the variation. You can also disable a variation if you no longer need it for the test. Click here to learn how to disable a variation. Elements modified: The elements you modify in a test page impact its conversion rate. Be sure to select elements that are most prominent in the test page. If you modify less significant elements such as footer, you may not notice much improvement in the conversion rate. 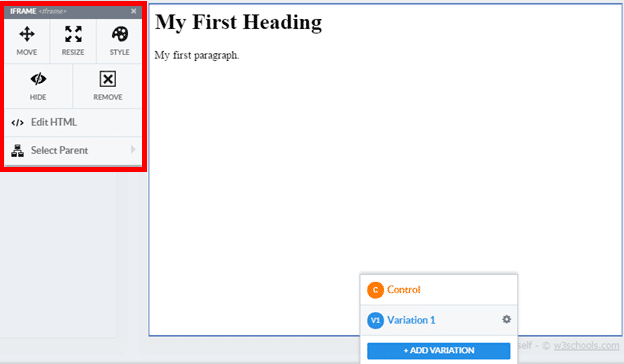 Difference in variations: You may notice a significant difference in conversions if variations are drastically different from the control version of the test pages. If changes in the variations are minor such as increasing the font size, the difference in the conversions rate could be minimal. Number of variations: Larger the number of variations, higher the chances of coming up with a winner. However, having a large number of variations requires you to run the campaign for a longer duration. Although improvements in conversion rates vary according to the type of a website, a conversion rate difference of >10% can be considered reliable. In some cases, you may even get more than 200% improvement in the conversion rate. Yes, you can use VWO to set up changes in the AJAX elements on a webpage. This is useful when changes are applied using editor operations. If your website is a single-page application, you need to execute the VWO tracking code, as explained in this article. The VWO smart code was added via a tag manager: When using a tag manager to load the VWO code, ensure that the tag manager is set to Synchronous code. When the tag manager is set to Asynchronous code, your visitors might see a flicker in the variations loaded. This means that when visitors are supposed to see a variation, they will see the control page for a moment before the changes appear, as the code is loaded by the tag manager. As a best practice, you should manually add the VWO smart code directly on your campaign pages. Reach out to VWO support for any assistance. For example, VWO supports integration with the Tealium tag manager flawlessly when Tealium settings are configured with Synchronous code. // Avoid multiple setIntervals gettings started. Reach out to VWO support for any assistance. The VWO smart code is added to the bottom of the webpage and not in the header: If the VWO smart code is added at the end of the web page, the browser executes the VWO code only in the end. In the meantime, you may notice a flash of the original (or control) page before you see the variation page. Ensure that the VWO code snippet is added to the header of the web page. Change image operation: If you add large-sized images to the variation, the images may take some time to download on the page. Until the images are downloaded, old images/content continue to be displayed. This might appear like a page flicker to the visitors. Here is a workaround for this problem. Yes, you can make changes to iframe tags in your website. Using VWO Editor, you can edit the iframe URL, change style and placement, and so on. To use the feature, you must first load the webpage containing the iframe content into Visual Editor. On clicking the element, the editor provides the following options to modify the iframe content. No, you don’t need to make any extra effort to track conversions on HTTPS websites. You just need to use “https” in the goal URL while defining your test goals. Make sure you use correct URLs while defining the goals. Use appropriate regular expressions and page patterns when running the campaign on multiple pages. Click here to read how to use URL patterns in VWO. Ensure that loading mixed or secured content is enabled on your browser. Click here to enable blocked content on your website. However, if you have manually specified some query parameter under Included URLs, then the campaign runs on this URL only and no other query parameter is allowed. For example, the campaign will not run on the URLs of type http://www.example.com/?test1=a&test2=b. If a user lands on the URL http://www.example.com/?test=1, then the corresponding variation URL is http://www.example.com/v1/?test=1. If the variation page already has some other parameters, you should add an asterisk (*) at the end of the control and variation URLs to handle the parameters. Use VWO cookies to set up a funnel test across multiple pages. To learn more about how to implement a change across your website funnel, click here. Run a single campaign across all the pages by making changes to those pages while you go through them, using the campaign builder. Running multiple campaigns on the same page(s) at the same time. To run this setup, ensure that the changes made from within the campaign builder are not made to the same or overlapping elements. If the changes are made to the same element, then the campaigns may conflict with each other. No, use of VWO does not have a negative impact on your website ranking. For A/B and Multivariate tests, both the control and variations run on the same URL and test changes are made by VWO on the fly. There is no scope for content duplication which otherwise can affect your SEO ranking. However, SEO issues may crop up when you are running a Split URL test. To avoid the issue, use query parameter rel=”canonical” in the variation URL to avoid duplicating content. For example, in your Split URL test, there are two pages (say, http://vwo.com/A.php and http://vwo.com/B.php). When visitors land on http://vwo.com/A.php, half of them are redirected to http://vwo.com/B.php that contains some duplicate content on it. While Google will index both the pages, by adding the above code, you are telling Google to use only http://example.com/A.php for SEO purposes. Here’s the Google link on using canonical URLs. The following are best practices for creating and running tests on your website. You can refer to the original article from Google here. Absolutely yes. VWO requires only your root domain and works as long as the root domain is the same. For example, you want to create a Split URL test for a website www.example.com (which is your control version). The variation you create for the test is www1.example.com. In this case, your test will work on both the domains because the root domain of both is the same, that is, example.com. ATTENTION You need not enable the Campaign involves multiple domains option while creating a test on sub-domains, as explained in the example above.